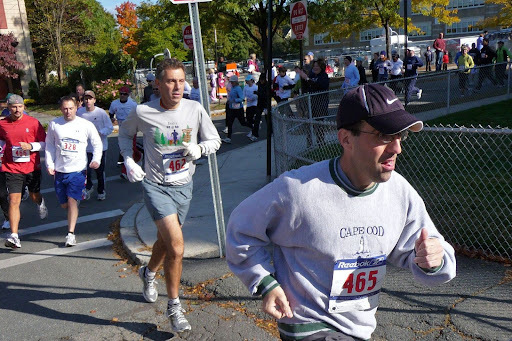 Here are photos I took while running the Allan D. Morrison 5K in Melrose, MA. This was the first year of the race, but the race director and all the volunteers did a terrific job. The course was scenic, well-marked and well-supported. However...I should add that it started FAST and ended hard. The first two miles were a downhill romp, and I reached the 2-mile mark a full minute ahead of my pace from last week's 5K. Oboy, I thought. I'm going to PR today! No such luck. The final mile was uphill. Not very steep, but every step was uphill...and that was enough to take the wind out of my sails. So I finished almost a minute slower than my time from last week's 5K. But that's okay. I ran through a beautiful community, surrounded by happy runners, and I have no complaints. After the race I had to leave to meet a friend for coffee and conversation...but I understand that the race organizers hosted an excellent post-race gathering with food and drink.